Professional Vision "80's Tribute" Benefit Show! Fri Oct 7th 9pm Michael's Cafe Timonium! ← New Commercial! Photos of the Professional Vision ZEISS Stage at Hot August Music Festival! The Professional Vision Timonium & Carney team is excited to announce that we’re having our 1st benefit show for the Foundation Fighting Blindness on Fri Oct 7th at 9pm! What better way to start things off than with an 80’s tribute w/ some of the best musicians in area! 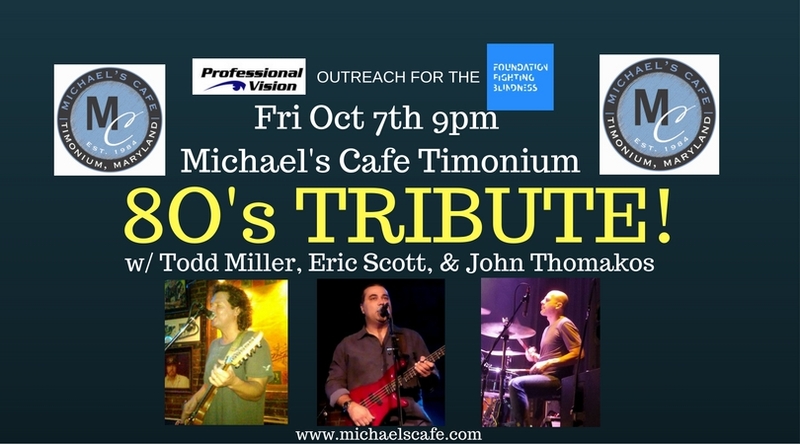 (Todd Miller, Eric Scott, John Thomakos) Thanks to Michael’s Cafe in Timonium & Scotty B’s Entertainment! This should be a lot of fun!!! We also plan to raffle off a pair of Maui Jim Sunglasses! NO COVER! **If you plan to have dinner there, we suggest calling ahead for reservations, or click here for Michael’s Cafe’s Open Table site. Try to request seating in the booths in the bar area where the music will be. **If you can’t make it to this event, but have a loved one affected by blindness, or want to support the cause, please help us reach our goal by considering a donation. Click here to Donate & Support the Foundation Fighting Blindness. Thanks! This entry was posted in benefit show, boutique designer eyewear, lens technology, music festival and tagged 80's Tribute Show, baltimore, benefit show, boutique designer eyewear, carney, cockeysville, dr barnstein, dr. richard barnstein, eye, eye doctor, eyedrbarnstein, foundation fighting blindness, michael's cafe timonium, oregon ridge park, perry hall, professional vision, richard barnstein, timonium, vision, white marsh, ZEISS. Bookmark the permalink.